David is starting a new course for Elmtree Training Centre called The Complete Canine Course. A six week course for pet dog owners, taking you through a journey of relationship building, of understanding how dogs learn and how they develop. 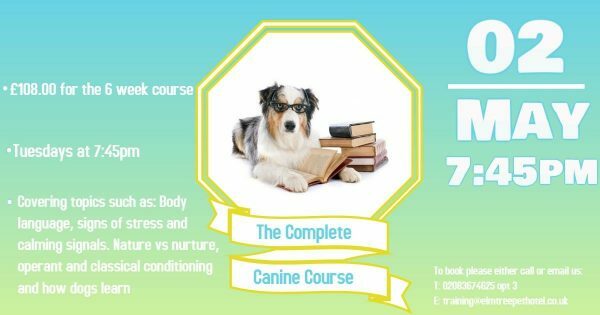 The course covers topics such as operant and classical conditioning, how dogs learn. Body language, signs of stress and calming signals. Nature vs Nurture, breed specifics and predisposed behaviours. There will be practical exercises and demonstrations each week for you and your dog to help you understand these subjects. A really worth while course for understanding the foundations behind creating a unique relationship between you and your dog. Course will be run on Tuesdays at Elmtree Training Centre, Tyle Kiln Cottage, Theobalds Park Estate, Waltham Cross, Herts EN7 5JB at 7:45pm starting from 2nd May 2017. The course costs £108 inc VAT, spaces are limited please book early to avoid disappointment. You must be able to commit to the full 6 weeks as there will be no catch up lessons. Please Call the office on 02083674625 or Lyn on 07983382449 to book your place and make payment.